We are having a magnificent fall, the weather has been cool at night and beautiful and sunny in the day. The colors of the leaves are at their peak, with vibrant oranges, yellows and reds. I just want to sit and admire the trees as I am hurried running errands. But today, I took a leisurely walk and enjoyed the smells of fall. The tide was low and calm and the trees looked perfect reflecting on the water’s movement.Neighbors are already decorating for Halloween. We decorate the day of Halloween to surprise our kids. That’s my excuse, we aren’t as organized as our neighbors. Pumpkins are abundant. Pumpkins, pumpkins, everywhere. Pumpkin pies, pumpkin cakes, pumpkin cocktails, pumpkin soup, I see it on Facebook, Pinterest and Twitter.Today, I made Pumpkin Black And White Cookies. I have never tried a Black And White Cookie, I have seen them before in the New York City bakeries, they are the size of my hand. 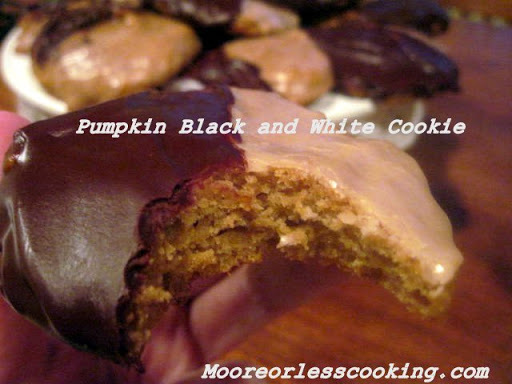 But today I baked Joy The Baker’s Recipe of Pumpkin Black and White Cookies. This is a soft cookie, with a wonderful chocolate and cinnamon glaze, hence the black and white. To get the recipe click HERE . preheat oven to 375. line a few baking sheets with parchment paper. in a medium bowl, whisk flour, baking powder, baking soda, salt, cinnamon, ginger, and nutmeg together. in a bowl of a stand mixer fitted with the paddle attachment, cream the butter and brown sugar on medium speed until light and fluffy, about 3 minutes. beat in the eggs until combined. with the mixer on low, add the pumpkin, evaporated milk, and vanilla and beat until well blended, about 2 minutes. keep the mixer on low and add the dry ingredients. beat until just combined. transfer the batter to a pastry bag fitted with a round tip and pipe 2 inch rounds onto the prepared baking sheet, leaving about 1 1/2 inches between them. bake for 12 minutes, or until the tops of the cookies spring back when lightly pressed. let cool on wire racks. for the vanilla glaze: whisk all ingredients in a bowl until smooth. with a small offset spatula or a knife, spread vanilla glaze on one half of every cookie. let dry a bit while you make chocolate glaze. for the chocolate glaze: melt the chocolate and butter together in a double boiler (or you can use a microwave). whisk in the corn syrup and cinnamon until it’s glossy and smooth. frost the other halves of the cookies with the chocolate glaze and set them out for the glazes to firm up a bit. they keep well covered at room temperature or in the fridge for a few days.